Mogk, Jeremy PM, and Peter J. Keir. "Evaluation of the carpal tunnel based on 3-D reconstruction from MRI." Journal of biomechanics 40.10 (2007): 2222-2229. While deviated wrist postures have been linked to the development of carpal tunnel syndrome, the relative contributions of posturerelated changes in size, shape and volume of the carpal tunnel contribute to median nerve compression are unclear. The purpose of this study was two-fold: (1) to reconstruct the carpal tunnel from MRI data in neutral and non-neutral (30° extension, 30° flexion) wrist postures, and (2) to evaluate errors associated with off-axis imaging. Three-dimensional reconstruction of the carpal tunnels of 8 volunteers from the university community revealed that the orientation of the carpal tunnel was not directly explained by external wrist angle. The average orientation of the carpal tunnel was extended in all postures, ranging from 25°±9° in extension, 13°±5° in neutral and 4°±4° in the flexed wrist. 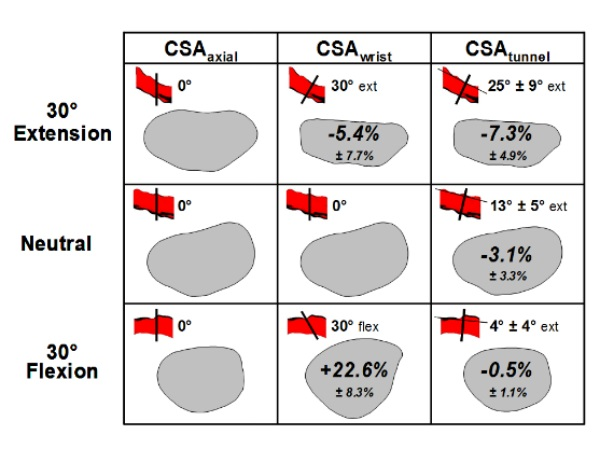 Changing the orientation of the imaging plane to be perpendicular to the reconstructed carpal tunnel revealed that axial images overestimated cross-sectional area by an average of nearly 10% in extension, 4% in neutral and less than 1% in flexion. Similarly, adjusting the imaging plane to be perpendicular to external wrist angle overestimated cross-sectional area by an average of 2% in extension, 4% in neutral and 24% in flexion. Distortion of the carpal tunnel shape also became evident with rotation of the imaging plane. The data suggest that correction for the orientation of the carpal tunnel itself to be more appropriate than relying on external wrist angle. Computerized reconstruction provided detailed anatomic visualization of the carpal tunnel, and has created the framework to develop a biomechanical model of the carpal tunnel. Similar reconstruction of the tissue structures passing through (median nerve and flexor tendons) and entering the carpal tunnel (muscle tissue) will enable evaluation and partitioning of median nerve injury mechanisms.